Update 25-05-2018: E-ride changed her name to EEZZGO. Lately received an invitation to the launch event of EEZZGO, a new startup in Amsterdam. The company will be renting out small electric cars, called Biro, to both locals and tourists. The small environment-friendly vehicles are 100% electric and can drive up to 45 km/h. 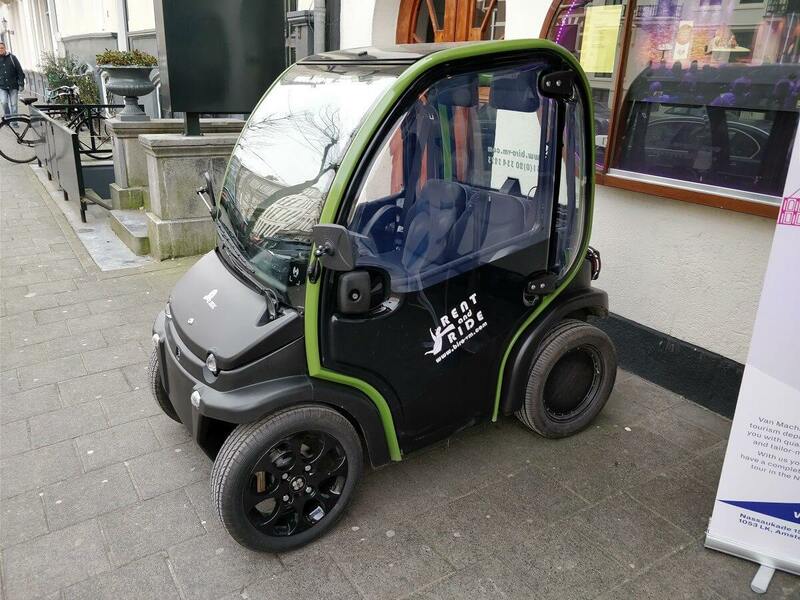 Due to the compact size of the cars, they can easily be parked in the busy city of Amsterdam. The company wants to play a role in the city’s endeavour to be an emission-free city by the year 2025. As we’re always interested in innovative concepts that might change the face of Amsterdam, so we decided to make our way to the event. Guided tours for visitors: a tour along Amsterdam’s highlights sheltered away from the Dutch weather, but with a 360 view so you don’t have to miss out on anything. Daily/hourly rentals: a convenient way for locals to move through the city without having to worry about parking. In the near future, the company wants to offer an annual subscription to regular clients. Renting a Biro car would then work as easy as the successful Car2Go car-sharing concept. During the presentation, we learned that the electric Biro cars offered a new challenge for Dutch law. At this point, it wasn’t totally clear how the Biros should be categorized, resulting in a situation with out clear rules and regulations. This comes with benefits, such as not needing a license to drive and no restrictions on where to drive and park. Thus, the Biros can now be driven on both the open road and the bicycle lanes. Due to its low top-speed, the Biros are not appropriate to drive on the motorway. Taking the Biro for a spin! After the presentation, it was time to take a Biro out for a spin! It’s a good thing we’re not too big, as the Biro’s are really small. With two adults the cars are quite ‘cozy’, so you’d better like the person sitting next to you. After some instructions on the controls, which are quite similar to an average car, we were ready to go. Driving a Biro is a lot of fun! We were instantly laughing while driving. Without making any sound the tiny car takes off, similar to a bumper car. Although driving the car is quite easy and the steering feels intuitive, the busy Amsterdam traffic offers the biggest challenge out on the road. We think the Biros can offer a great, emission-free way of transportation in and around Amsterdam. Especially an easy Car2Go subscription or pay per kilometer concept could work great for locals! For tourists, the Biro would offer a fun way to discover the city, sheltered away from the wind and rain. However, we were rather concerned by the fact that there are no clear regulations or laws by the government. In a crowded city like Amsterdam, innovative concepts like these need strict regulations and governmental guidance in order to work out. In the past, we’ve seen clever concepts like shared bicycles, strand due to a lack of governmental guidance. We have strong doubts on driving Biro on the crowded bike lanes of Amsterdam. We think the cars are too wide and are better off on the roads. The Biro concept would also offer a great way for visitors to discover the hidden gems surrounding Amsterdam; Volendam, Ouderkerk, Weesp, and Muiden for instance. How do I book these cars in Amsterdam, your website does not work? Hi Tiarna, thanks for your reply. Unfortunately, the company seems to have gone bankrupt. We have noticed that their website is down and we have tried to contact them several times without success.